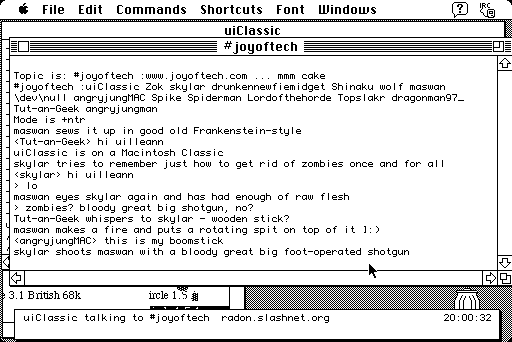 The purpose of this page is not to show the Classic, but my prized SCSI Ethernet adapter. 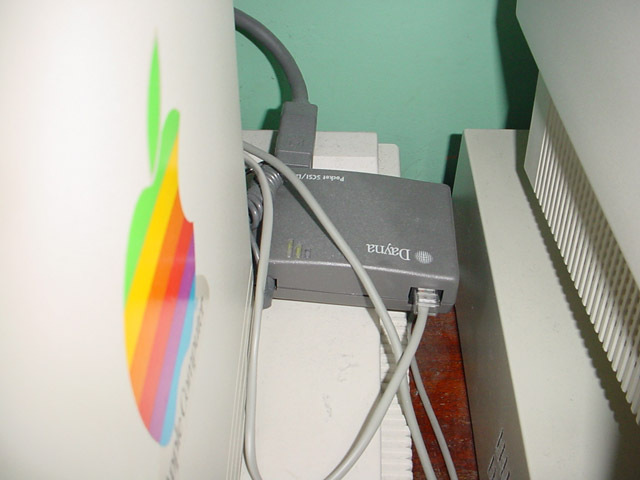 Before discovering it, I used to have a feeling that Ethernet with SCSI existed, but nevertheless suspected that it was just a myth of my imagination. 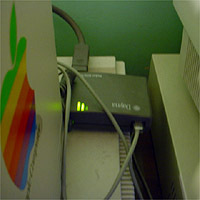 Until I found a real live SCSI Ethernet adapter at a car boot sale for £2. 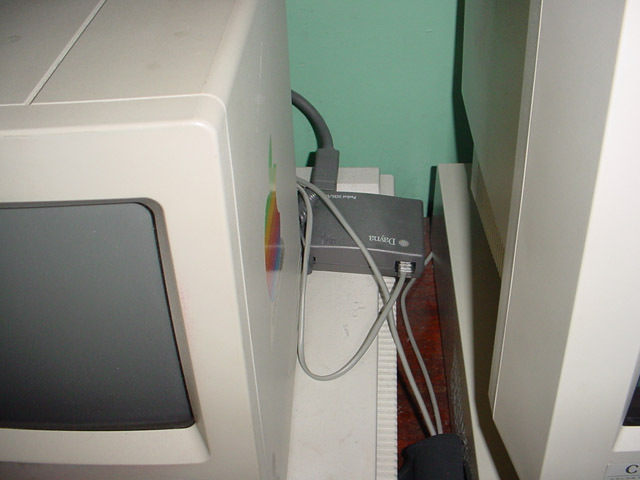 It’s a strange device; the UK model does not come with a power supply, so the only way to power it is via the ADB pass-through cable that draws power from the desktop bus (with a socket for the keyboard and mouse if you are not using a PowerBook). 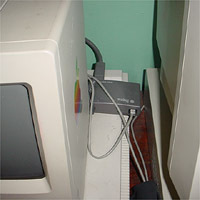 SCSI is via a very thick, inflexible cable that makes positioning the device tricky. But to me at least, it is a very strange little thing and I am quite chuffed to be in possession of one. 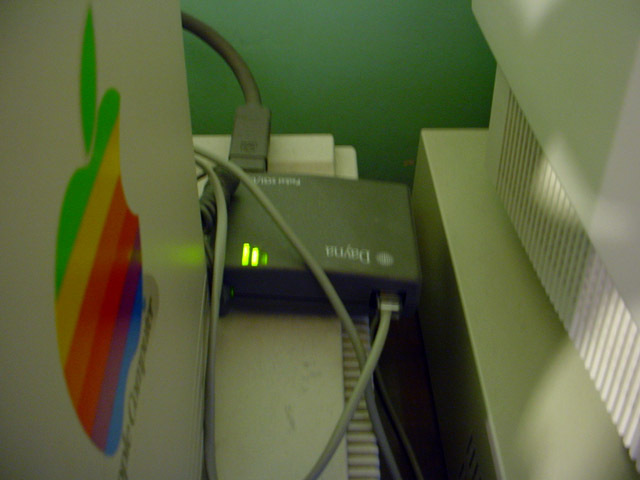 It is 10Base-T, so it’s below cable modem speed and plenty fast enough, and much faster than the 8 MHz Mac to which it is connected. 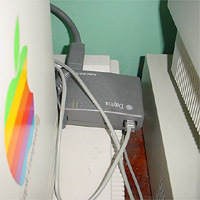 Only the American models shipped with an external power supply; overseas owners were expected to use the passthrough cable if they didn’t want to purchase a separate power supply for it. If anyone else wishes to run it from external power or has lost their power supply, it takes 5 volts DV at 1 amp, and the polarity is positive inside, negative outside (I believe). 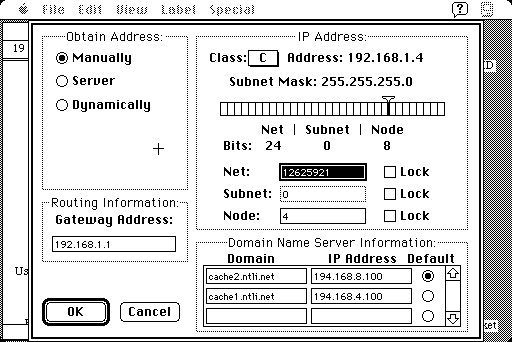 As much as the NIC is beautiful, MacTCP – the original TCP/IP stack for Mac OS – is horrible. I have a computer science degree so working out the secret code for the IP address for my Mac (without any documentation) was a mere royal nuisance. For a lot of people it would be impossible without the documentation, which was probably all written in ancient Coptic anyhow. And given that the gateway and DNS server addresses are mere text boxes, I am convinced that this is some kind of torture device for weak souls.